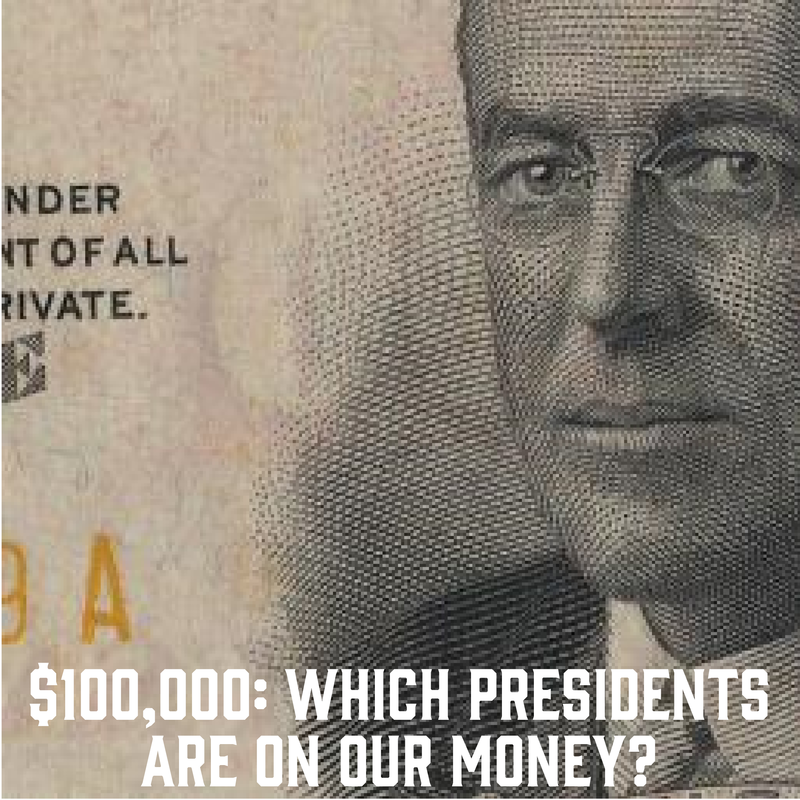 $100,000 bill: Which presidents are on money? Money fascinates people of all ages. Its portraits, symbols, and words tell a story of our nation’s past. For many years, Lady Liberty was the most common icon on currency. Today, images of presidents dominate our money. At times a fallen president is honored on currency, such as FDR, JFK, and Eisenhower. Perhaps a president like Andrew Jackson would recoil at his portrait on a $20 bill. Lately, women have re-established their place on our money: Susan B. Anthony, Sacagawea, and in the near future, Harriet Tubman. The images on our money highlight the icons that have found a permanent place in our country’s history. Money presidents can be collected as artwork, passed on in collections, or handed over a counter to buy a soda at the store. We use them everyday. These are the presidents on money. George Washington first appeared on the one-dollar bill in 1869 – just seven years after the bill was first printed. The first person to appear on the one-dollar bill was Salmon P. Chase, the Secretary of the Treasury at the time (1861-1864). According to the Bureau of Engraving and Printing, the one-dollar bill makes up about 45% of currency printing production. The two-dollar bill features Thomas Jefferson on the front of it. Jefferson has been on the two-dollar bill since 1869. Interestingly enough, the first two-dollar bill was printed in 1862 and featured the face of the first Secretary of the Treasury (and Jefferson political adversary) Alexander Hamilton. Despite the government’s best efforts since its creation, the two-dollar bill remains one of our country’s least circulated bills. The most recent printing of the two-dollar note was the 2003 series. The portrait of Abraham Lincoln has appeared on the five-dollar bill since 1914. Like other federal reserve notes, the five-dollar bill is composed of one-fourth linen and three-fourths cotton. Look closely, the five-dollar bill also contains red and blue security fibers. Andrew Jackson replaced Grover Cleveland on the twenty-dollar bill in 1928 – one hundred years after Jackson was first elected as president. Due to Andrew Jackson’s somewhat controversial nature, some groups have petitioned the government to remove his face from the twenty-dollar bill. But as it stands now, “Old Hickory” will continue to be dispensed out of ATMs across America. Ulysses S. Grant first appeared on the fifty-dollar bill in 1913. Like Jackson, Grant has faced opposition to his appearance on U.S. currency. In both 2005 and 2010, legislation was brought to Congress to have Ronald Reagan’s face put on the fifty in place of Grant’s, but these measures were voted down. “Unconditional Surrender” Grant does not give up his position easily. According to the Bureau of Engraving and Printing, in 1969 the Department of the Treasury and the Federal Reserve System announced that currency notes in denominations of $500, $1,000, $5,000, and $10,000 would be discontinued due to lack of use. William McKinley has been on the $500 bill since 1928. If you find a $500 bill laying around somewhere, don’t worry. It’s legal tender, and it may be used. However, you’d probably be better off selling it to a numismatic dealer or collector instead of buying a new iPad. Grover Cleveland appears on the $1,000 bill. Cleveland was on the twenty-dollar bill before he was replaced by Andrew Jackson in 1928. In April 2013, a $1,000 bill from 1891 sold at auction for $2.5 million. It was not Cleveland’s image, however, that graced the front of the bill. It was U.S. General George Meade. Who knew money could actually be worth so much money? James Madison, The Father of the Constitution, is on the $5,000 bill. He worked to establish our federal government and served as the fourth president. Madison has appeared on the bill since 1918. Woodrow Wilson’s image is on the largest U.S. note ever printed – the $100,000 gold certificate, series 1934. These notes were printed from December 1934 to January 1935. According to the Bureau of Engraving and Printing, the $100,000 bills were used for transactions between Federal Reserve Banks and were not circulated among the general public. A tried and true Federalist, Hamilton was the first Treasury of the Secretary and a supporter of a national bank system. Inventor, author, statesman, and true American genius – Franklin’s ideas shaped the founding of our country. As Lincoln’s Secretary of the Treasury, Chase established a national bank system and paper money. He later served as Chief Justice of the U.S. Supreme Court. Abraham Lincoln first appeared on the penny in 1909 – the 100th anniversary of his birth. It was President Theodore Roosevelt who is credited with urging a redesign of the penny in 1908. Before Lincoln, the penny had the same imagery since 1859 – Liberty wearing an American Indian headdress. When the Lincoln was issued in August 1909, Abraham Lincoln became the first president to appear on a coin. The Lincoln Memorial was added to the reverse of the penny in 1959 – the 150th anniversary of Lincoln’s birth. If you look closely, you’ll see Lincoln’s statue sitting inside of his memorial. Until 1999, Lincoln was the only person to appear on both sides of a coin. George Washington became the second when he appeared on the reverse of the New Jersey state quarter – crossing the Delaware River during the American Revolution. On the 200th anniversary of Lincoln’s birth, the U.S. Mint released four new designs for the reverse side of the penny. The designs featured key events from Lincoln’s life entitled: Birth and Early Childhood in Kentucky, Formative Years in Indiana, Professional Life in Illinois, and Presidency in Washington, D.C. In 1938, the Treasury Department announced that it would hold a competition to create a new design for the nickel – with Thomas Jefferson to appear on the front. The winning design featured a bust of Jefferson dressed in a suit and looking to the left. Jefferson’s home, Monticello, appeared on the back. The Jefferson nickel was first issued in November of 1938, and our third president has been on the nickel since. In 2003, on the 200th anniversary of the Louisiana Purchase, Congress passed a bill to change the design of the nickel. In the Westward Journey Nickel Series of 2004-2006, the original left-facing Jefferson was replaced with a newright-facing Jefferon and forward-facing Jefferson. Four new Jefferson Era designs appeared on the back, along with a newly-designed Monticello. Franklin D. Roosevelt first appeared on the dime in 1946. FDR died in April 1945, and the Mint decide to honor him on a coin. The dime was chosen for Roosevelt due to his work to end polio through the March of Dimes. The reverse of the dime features a torch in the center with an olive branch on the left and an oak branch on the right. The torch symbolizes freedom, the olive branch is peace, and the oak branch is strength. From 1946 to 1964, the FDR dime was composed of mostly silver, but from 1965 to the present, the dime has been composed of base metals. Compared to other U.S. coins, the dime has received little attention for a redesign – bearing the same design since the post World War II era. In 1932, George Washington became the second president to be featured on a coin (Lincoln was the first). The U.S. Mint initially intended to produce the Washington quarter for one year – in commemoration of the 200th anniversary of Washington’s birth. However, the Mint decided to stick with George, and he’s been on the quarter ever since. Keep a look out for silver quarters; they can be quite valuable. Quarters produced from 1932 to 1964 contain 90% silver and 10% copper. Today’s quarters are made of mostly copper and no silver. Within days after the 1963 assassination of President Kennedy, the U.S. Mint initiated plans to release a coin featuring JFK. By early 1964, the first Kennedy half dollar was released. Kennedy replaced Benjamin Franklin -who appeared on the half dollar for only fifteen years (1948-1963). The silver content of half dollars has changed over the years. Franklin half dollars and 1964 Kennedy half dollars are 90% silver and 10% copper, while Kennedy half dollars from 1965-1970 are only 40% silver (and 60% copper). Since 1971, Kennedy half dollars are made of mostly copper. After Dwight D. Eisenhower’s death in 1969, the U.S. Mint sought to memorialize the former president on a coin. Ike dollar coins were minted from 1971 to 1978. In addition to honoring Ike on the front, the coins paid tribute to the successful Apollo 11 mission on the back. An eagle is landing on the moon with the earth hovering in the background. The Mint discontinued the Eisenhower dollar in 1978, but did change the reverse design one time – in 1976 on our country’s bicentennial. The U.S. Mint began making presidential dollar coins in 2007. The coins were released in the order that the presidents served. Ronald Reagan is the final coin in the series – as no living person can appear on currency. Anthony was a social reformer who worked as an abolitionist and a women’s rights activist. Her efforts paved the way for the 19th Amendment – which gave women the right to vote in national elections. As a guide and interpreter on the Lewis and Clark Expedition, Sacagawea was integral to the success of the cross-country journey. No known images of her exist. In 2009, the U.S. Mint introduced new designs for the reverse of the Sacagawea coin. The designs featured significant contributions from Native American tribes and individuals. The coins show a variety of scenes from our country’s history, including the the treaty signed by the Wampanoag and the Plymouth Colony in 1621, the Code Talkers from WWI and WWII, and Sequoyah – the creator of the written language of the Cherokee Nation. Before presidents, Liberty’s image could be found on almost every form of currency. She first appeared on a coin in 1793, and today, her name remains as a reminder of her former glory. In 2017, the U.S. Mint will release a newly-designed Liberty in honor of the Mint’s 225th anniversary. Click here for unique items in our Shop. Previous Post JFK’s Portrait: Why is he looking down? Next Post Who is your favorite president?